Water, green spaces, and dunes. 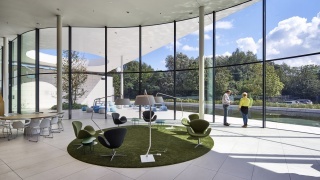 Those were some of the elements which Kraaijvanger architects from Rotterdam went to work with after the firm had been approached by PWN (Puur Water Nederland), a water company that also manages the dunes of North Holland province, to embark on a major overhaul of its head office. PWN had various departments spread across multiple sites and wanted to bring them together at its head office. But that would only be possible if the workstations were changed fundamentally from being person-related to activity-related. 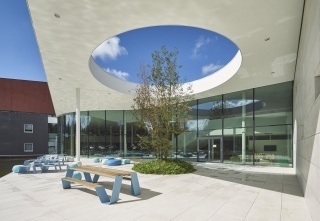 It was a major renovation and an exciting challenge in which Kraaijvanger was able to strike the right balance between intelligent functionality, cherished sustainability, and an eye-catching design. 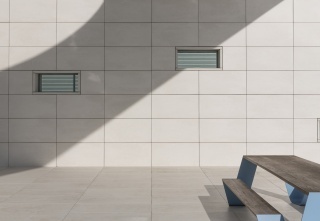 The flow effect is reinforced – in what is the vital heart of the building – by using the large 60 cm x 120 cm tiles from Mosa’s Terra Maestricht series and not only having them run from inside to outside, but also fixing them on the interior and exterior walls. This creates a particular cachet. 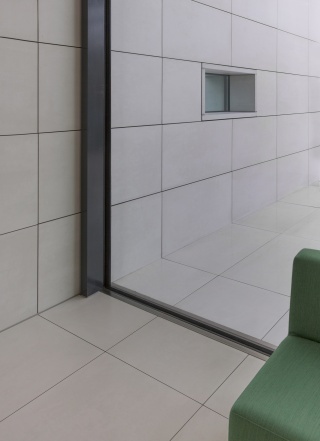 In consultation with Mosa we also opted to incorporate the tiles on the exterior floor into a supported system, as a result of which they were actually lifted. That allowed the horizontal seams on the floor to run into the vertical seams on the walls, as invisible fixing systems with anchors were also used on those walls, enabling the same open grouting system to be used.’ And because the dimensions of all of Mosa’s tiles are harmonized to the millimetre, the grout lines on the interior and exterior floor, and even on the exterior wall, can be perfectly aligned. 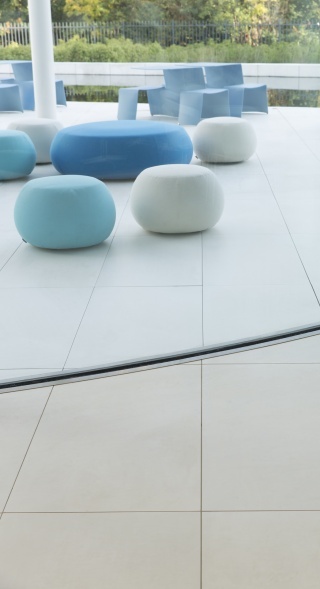 Because the floor is floating, there is a further specific advantage that is a major plus for all the parties concerned: the floor can be fully removed and can therefore be used entirely on a cradle-to-cradle basis. The tiles can be removed cleanly and can easily be reused in other places. That sustainability aspect – and hence the fulfilment of social responsibility – is a common thread running through the business philosophy of this firm of architects, the client PWN and Mosa. As stated previously, the elements of water, green spaces, and dunes were very important in the contract awarded by PWN. That is reflected not only in the materials and techniques used, but of course also in the design. 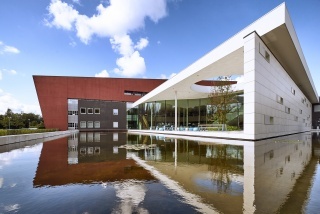 The reflection of the building in the pond bringing in extra light, the use of curved glass in the atrium, the fitting of triple glass throughout, the installation of a climate ceiling, the green accents in parts of the interior, the vegetation roof on the atrium that absorbs rainwater and provides additional insulation, and the sand appearance of the beige XT tile are all examples of how you can achieve the utmost in terms of both function and form. ‘Form follows function,’ the famous architect Mies van der Rohe once said, and that is a statement which we as a firm of architects fully endorse. Architecture is an applied art form. Perhaps the most practically applied art form that there is. It is precisely the boundary conditions, functions, and crucial factors that make architecture so interesting. They are the drivers of the design process and must not be merely a sum of the parts; they must grow into a visually all-embracing gesture. In short, form must have meaning and, as far as our firm is concerned, form must not be a mere flourish reflecting the ego of the architect. Management and maintenance must go hand in hand with appearance. By applying the three elements visually and functionally in all kinds of subtle ways in the PWN head office, we have created a building that is transparent, that surprises and above all connects.